Today's Inspiration: Bob Peak: "... when you turn the page it's all over." Bob Peak: "... when you turn the page it's all over." "The contemporary illustrator is an artist when he solves the problem of his client. The fine artist is an artist when he solves the creative problem he has set for himself. As a contemporary illustrator, my own primary objective is to satisfy the client." "... the accelerated growth of technology causes rapid change... in this age few man-made things last. Airplanes, cars, and clothes change style rapidly. The chrome strip on a car has nothing to do with function other than the function of stimulating sales. Similarly, the woman's magazine changes format when its sales drop or its market changes. This is a phenomenon in which the contemporary illustrator is involved. Solving the problems of rapid obsolescence breeds a unique kind of artist whose premise must be: when you turn the page it's all over." "Our function is to solve the problems of a temporary, of-the-moment product - the result being a temporary, of-the-moment product! To compete professionally as an illustrator will require all you have to offer and then some. That is what makes commercial art an exciting, vital occupation." "For me the solving of the problem, the creative process, is more exciting than doing the finish. The finish, of course, is as important as the loudspeaker of a hi-fi rig. It must be good, but if the music that comes out of that speaker doesn't mean anything to the listener, who needs it?" "Before I start each job these are the things I consider: (1) Have I seen it myself; what experience do I have with the subject? (2) Who is the audience? (3) What is the problem and how can I solve it? (4) What materials should I use? (5) What style is best for the job?" 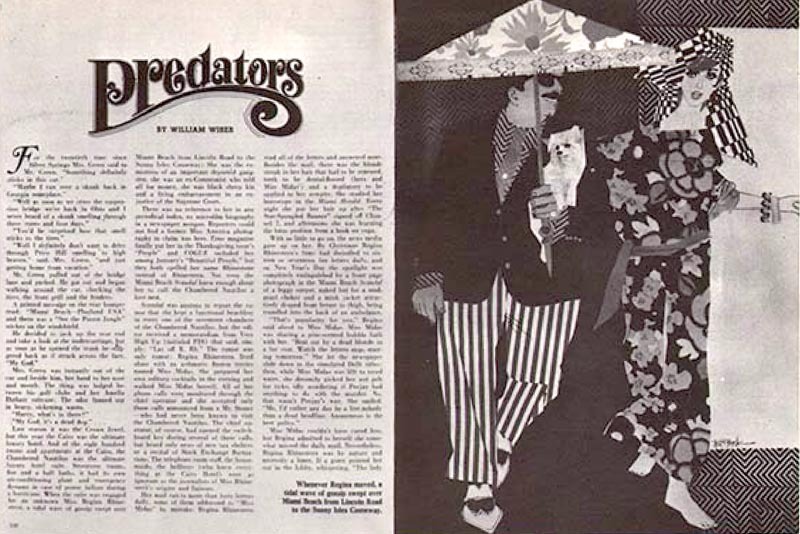 "Here are illustrations for four stories that appeared in one issue of Cosmopolitan. The problem was to give each a different look. One story, called "predators," was set in Miami. The locale, plus the flamboyant characters, led to a flamboyant interpretation. I cut out pieces of fabric and decorative papers and made a collage depicting the main couple. I didn't use models, but called on the mental image I had formed of these two people at my first reading of the story." "In the love story "Green Wind" the big love scene began when the girl turned off the light. My reaction was: What remained visible? The Answer: Nothing but a silhouette - which I cut from black paper. 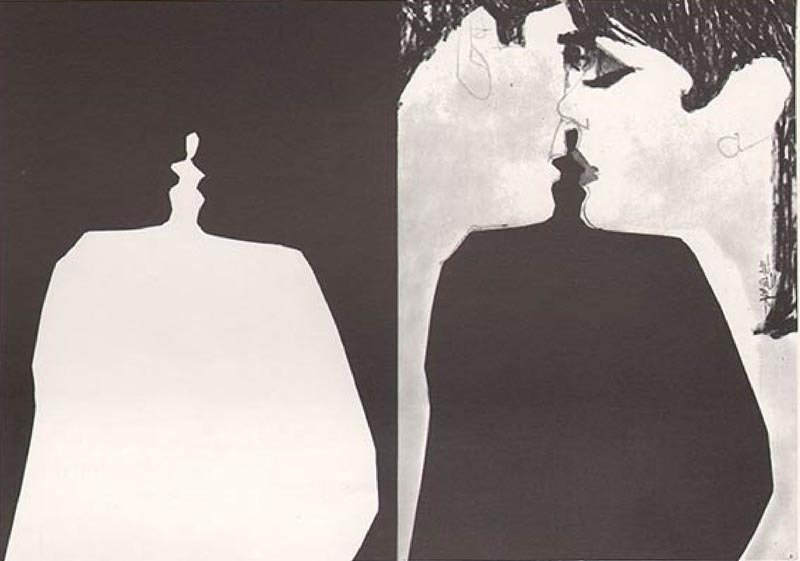 On the following page of the story appeared the same silhouette but with the values reversed." 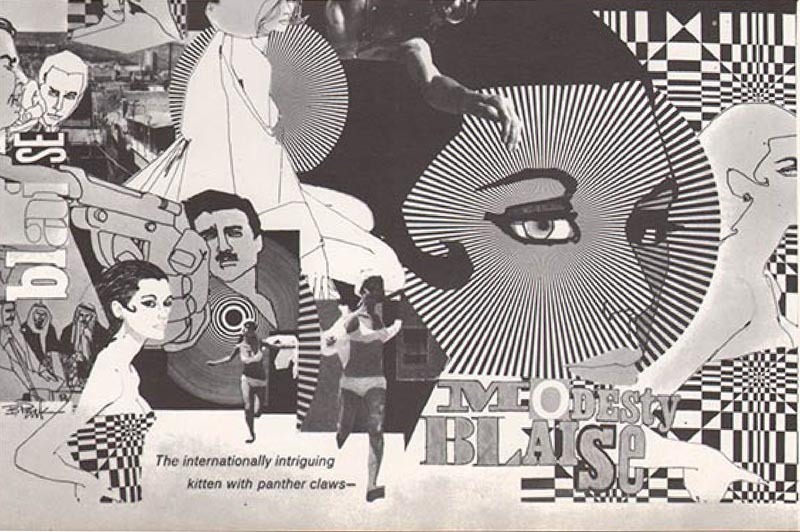 "In the illustration for "Modesty Blaise" I used drawing, silk screen, decorative papers, and photos to get the kaleidoscope look appropriate to this fast moving spy story." "The heroine of "Subject of change," another love story, is sophisticated and fashion-wise. I showed her, below, in a high-fashion robe. 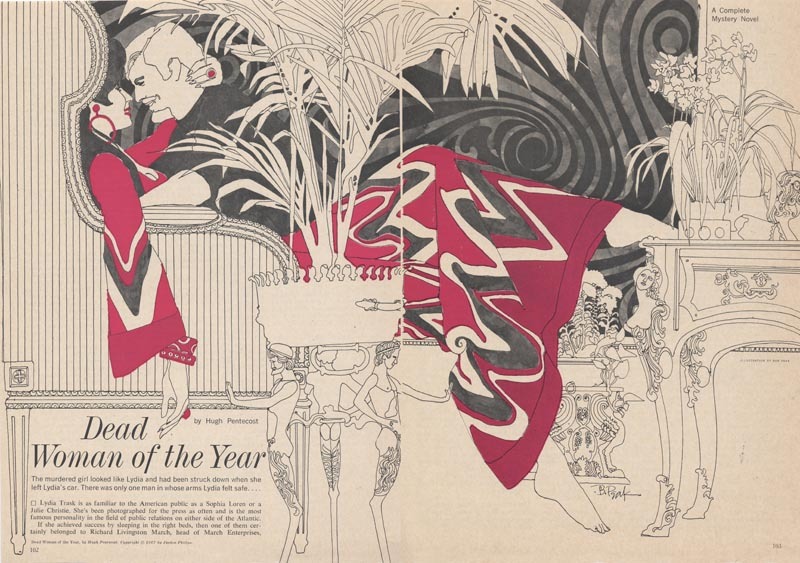 For style I went where many fashion designers were going - to the Art Nouveau of the early 1900's." "If youth represents the growing force in this country, then the contemporary illustrator should reflect that condition... and take the lead. just as the speaker must know his audience before he writes his speech, the illustrator must know his public before he makes his picture." "Modern communication has accelerated the changes in fashion. What used to last five years is good for only three nowadays. The outward appearance of art is, in itself, an aspect of fashion, so the involvement of the artist in the contemporary scene, the immediate moment, is obvious. This is what I mean when I define art as an act of doing." * Special thanks to David Apatoff for providing the two scans at the top of today's post and to Matt Dicke for the scans from Bob Peak's chapter of the Famous Artists Course. Bob Peak's work is absolutely amazing. Where have I been....where has Peak's work been....where and why have I not seen the examples that have been posted this week on TI. It's a mystery. Every time I make a comment or comparison on and of his Illustrations, I have to eat my words. Made a Peak comparison to Leif this morning....with Al Parker's work, and I must retract what was said. The examples today show every bit the carefully designed, eloquently executed draftsmanship, creative technical quality, and originality of one of Parker's creations. Parker had more range in his illustrative ideas.....or did he? Comparisons are not needed anyway....not even relevant. Excellent art is excellent art....to be admired, appreciated, marveled at....a feast for the eyes. Many thanks! I think Bob Peak had two major things going for him. He was the epitome of the contemporary, innovative illustrator, always searching for new concepts and new ways to present them.. and his timing was perfect, he was born at just the right time to cash in on the evolution of rapid change in illustration. He rode that wave from its beginning until the illustration market diminished in size, and dare I say, importance. Of course, he wasn't by himself in that category, but he was one of the most talented, and had a distinctive Peak-look to his work, even when it was constantly evolving and changing. Great week Leif, thrilled to once again see some old familiar Peak illos, and plenty of exciting examples that I haven't seen before. My approach to illustration was more traditional, but I admire his strong design, exciting color and flair that he always put into his work. He was a strong inspiration for me and lots of other illustrators. Gee Whiz! This is some smokin' stuff! 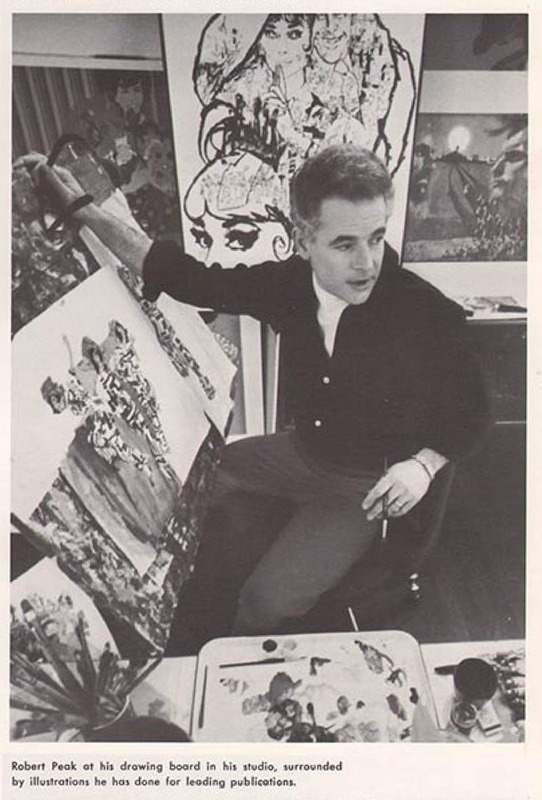 Wow I like the photo of Bob Peak here - he holds his brush like a cigarette. "A feast for the eyes"; to quote Charlie Allen. That holds for TI in general as well. "Our function is to solve the problems of a temporary, of-the-moment product - the result being a temporary, of-the-moment product! "The outward appearance of art is, in itself, an aspect of fashion..."
in quotes like these, Peak seems to be coming to terms with the fact that he is working in an ephemeral medium, subject to the whim of fashion. for better or worse, much of his work looks consequently, very dated. Agreed - the somewhat dated look is there - with op art or the like. But the sheer drawing-skill and energy of it in my view outdates the dated. When an illustration/illustrator works to the specific like Peak did, the results at first glance look dated. 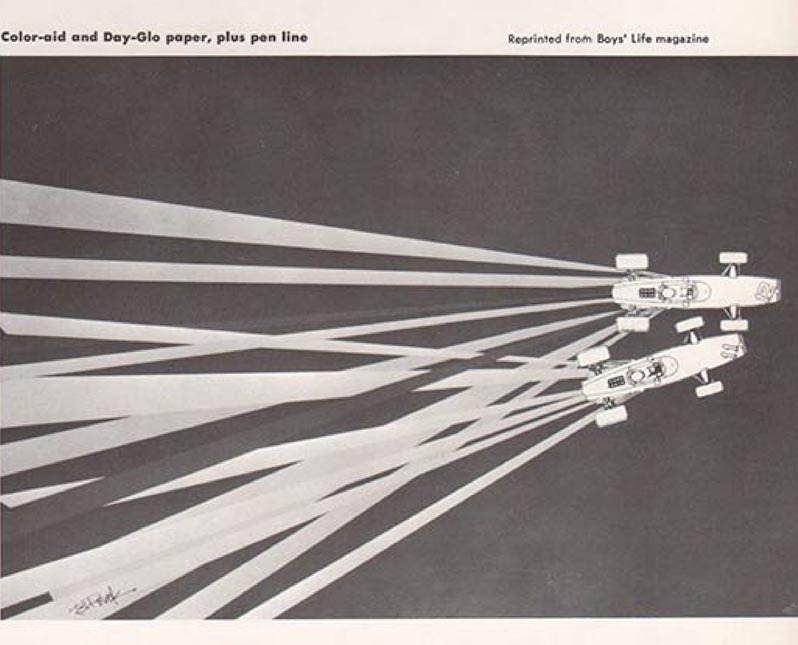 But most illustrators will/can tell you there is a lot that's timeless about Peak's work. The fashions of those days are bound to look dated today, just as the roaring 20s' fashions, hairstyle, etc., looked dated to us in the 50's and 60s'. However, Peak's composition and design only looks dated because today, I see very little of the quality of design and color sense that Peak, Fuchs, English and others were producing. At least I don't see it in the magazines or the public eye. When I do see occasional attempts at a montage or design oriented illustration, it is usually overly busy, unorganized, and lacks elegance and sophistication in my opinion. And, in light of that, I have to factor in Peak's quote, that you have to know your audience you are communicating to. The public's taste today is considerably different . Back in the day I had to keep my illustrations from looking like Peak's work or suffer by comparison. He was such a strong influence. He had that 'something' that was totally his. So is he saying that a drawing has no more value than the necktie it advertises.I find that sad.I'd als much rather have the peak illustration as an investment.So he was wrong in the long run wasn't he? At his best--He was the very best. Remo, I had the same reaction, but keep in mind that illustrations since WW 2, were painted mostly in water based pigments (not intended for longevity), due to tighter deadlines and convenience, and they were usually done in a small format (14" x 16" and smaller was common), and the illustrator knew that their art would be seen for a short time and then forgotten. They were usually stored indefinitely and occasionally lost and even stolen, or in some cases given to the client or family to hang on their walls, if requested. Also, illustrations were shunned by the general art community as merely commercial art, and not serious museum quality master pieces, or thought to be significant to art history. That ultimately became an inner conflict with some illustrators, and arrogant narrow-minded thinking from the fine art community elitists. I agree with you Remo, those illos are worthy of owning and collecting, and they are often extremely high quality art, regardless of their smaller format, less permanent medium and commissioned for commercial use. Attitudes have changed however, since period illustrations are receiving ever increasing interest and value from collectors and hopeful collectors. Lets hope that the prices don't go too high, where only the wealthy can afford them. Cool response Tom.But here's the deal,art will always have more intrinsic value than most anything else.It's just a question of time.And the more so the better the artist.That was always true and it will always be true.Its just that some so called clever people think they know better.And Peak made that mistake. Remo; No one's arguing the intrinsic value of art. Peak understood that and everyone else who loves art and loves making art understands that. But where you and many other lovers of art make your mistake is when you insist that the maker of neckties have an appreciation of art for its intrinsic value. To the maker of neckties, art's only value (at least in association with the maker's advertising) is in the increased sale of neckties. If the art in the necktie maker's ads does not (1) capture the attention of the reader and (2) assist in the sale of more neckties -- then the art is worthless. Devoid of merit. Intrinsically without any value at all. You may think that's sad - but what you think is inconsequential to the maker of neckties. He's not in the business of supporting the arts for their own sake. Too many artists have not understood this - but Bob Peak understood this intrinsically. That's the real beauty of Bob Peak's work and Bob Peak's success - he found both creative satisfaction and financial success by not making the mistake so many so called clever artists make: mistaking their desire for personal creative problem solving with creative commercial problem solving. Please take the time to read again the wisdom Bob Peak shared with us last week. I believe you missed the point. What about those artists who worked within the confines of the commercial world while expressing their own view point? Marshall Arisman and Brad Holland come to mind. I know that's not the point that Peak is getting at but wanted to know your thoughts. The necktie maker sees the value of aligning his product with some super cool art-in so doing he is acknowledging the true value of the art.Or else why not just print a photo of the product. Why do sponsors want to link their product to a glamorous movie star or football team? Its like if you were an insurance firm you might have used a Rockwell picture to buy in to the prestige and tradition the 'Rockwell brand' carried with middle America in the 50s or 60s. Thanks for your thoughts on the subject - it is so interesting and I believe ther are no black and white answers to these complex and subjective questions. I can't speak to the likes of Marshall Arisman or Brad Holland except to say I applaud them for their accomplishments. I think they and quite a few other illustrators have managed to enjoy a relatively rare circumstance of both creative and commercial success. But all though I suggest there are "quite a few" artists in that boat they still represent a tiny minority of commercial artists. The vast majority of us have had to come to terms with the reality of the marketplace. This is a personal choice and one closer to what, in my mind, Bob Peak was describing. I very deliberately began last week's series with the quote from Peak: "I want to be an advertising man." And the follow-up explanation, "I know that in my own work, the things I do for advertising are not the same as those I would do for a gallery show. I do what I do by choice." Daniel and Remo; I doubt very much that someone the likes of Arisman or Holland would make a statement like that. I'm not saying its the right or wrong attitude - but it is the central point of Peak's philosophy, and imo entirely valid. Peak went on to say, "The artist's reason for existence is the production of an idea. The finest illustrators working today all are people who work with ideas. 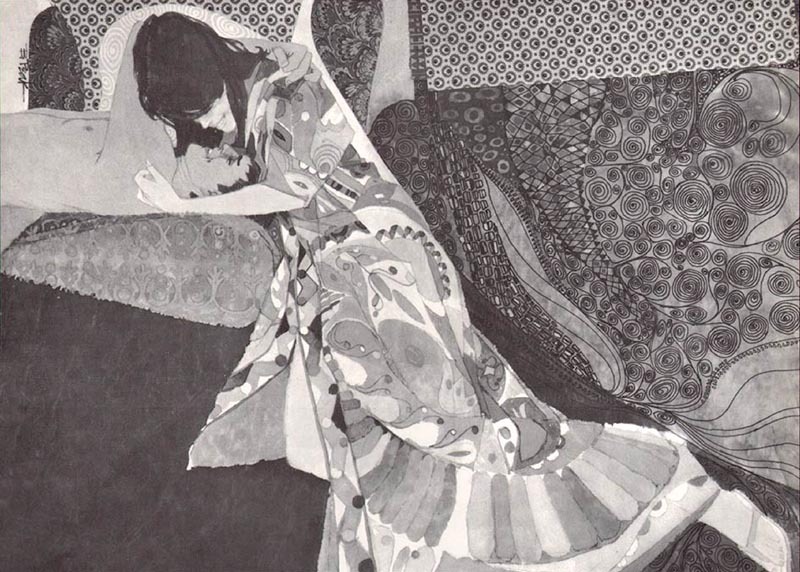 If illustration is to do anything at all, it must be a part of the total creative problem." Being part of the total is the key element - and the one so many artists miss. The illustration is only a component of the total advertising solution being sought - and the illustrator is not even in the driver's seat, the AD is. Many artists are not comfortable with their role as a subordinate in the process - a very few like Arisman or Holland might transcend that role... but I would suggest that those artists didn't or don't do much in the way of advertising illustration. * By the way, a quote I didn't get into any of last week's posts: "There are few restrictions, really. A car ad doesn't have to look like a car ad. In general, art directors respect the unconventional. It is true that the artist may have to change something he has done, but even then he will not go so very far back; he is not forced to produce a pedestrian piece of work. I do what I think is sound and accurate. In this, the best guide in the world, in art as in everything else, is common sense." This suggests to me that peak was already enjoying a degree of success much the same as one might ascribe to Arisman or Holland - and one that most illustrators would say is contrary in MANY ways to their own experiences! But notice he tempers his position with the advisement to use 'common sense' - that is, "... the things I do for advertising are not the same as those I would do for a gallery show." I agree eith a lot of that. But when Peak calls himself a 'problem solver' i think that overstates the case a bit.What the client really wants is that magical stardust that Peak created sprinkled over his product to confer 'nowness' and glamor.Example.If Peak's solution to the problem happened to look like a Fawcett illo the client would go nuts and say "I want a Peak picture"! So they are really buying Peak's brand and a certain kind of preconceived look to the 'solution'.Not something left-field.Dont get me wrong, I love Bob Peak (and that signature of his) but I question some of his philosophy. 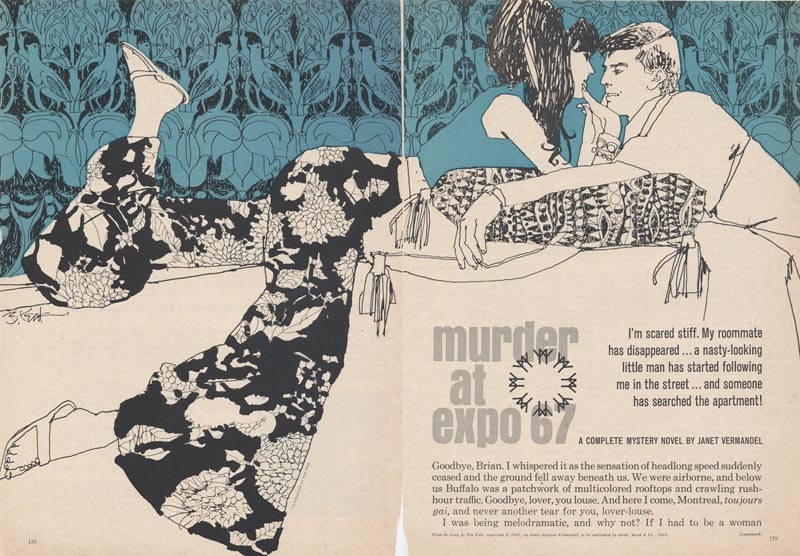 Is Steranko the Bob Peak of comics? I agree and just wanted to get your thoughts on the other side of the coin. Peak seemed to understand illustration for what it is, a commercial business. I'm sure in many ways that attributed to his success. Is Steranko the Bob Peak of comics? I dunno... but that Modesty Blaise piece by Peak certainly is reminiscent of some of Steranko's pop art imagery for S.H.I.E.L.D, isn't it? Daniel; Yeah, Peak really did seem to understand that. Interestingly, he talked about his first attempt at doing work in NY being a failure because he wasn't being himself - and then says you have to do your own thing to succeed - as Arisman and Holland did. It just goes to show how complicated - how multifaceted the whole situation is, doesn't it. Remo, I think Peak's reference to "problem solving" disputes the notion that the AD only commissioned Peak because he had a certain look and style that they wanted. Their may have been some that did, but apparently Peak didn't assume that. There is much more to it than that. He couldn't just paint a pretty picture that looked like his previous work, and sign it. I think the "problem solving" he was referring to, was to give the client a Peak illo that would also stop the viewer and communicate the message that was intended to sell a product, service or image for the client. Peak had no problem with producing art to "sell", but knew each assignment had it's own set of problems and solutions to be solved in order to be effective. In reading extensively about Rockwell, he had a famous name most of his long career, but he also had to come up with an effective concept, and render it to the satisfaction of the AD and the client. Even after approval of a concept sketch, while doing the finished painting, Rockwell would often agonize over whether it was communicating or "solving the problem". Unlike a sports figure, who just provides his endorsement and a mug shot, the illustrator may have a name that opens doors, but he or she has to illustrate an idea.. produce an effective illustration as an end product. 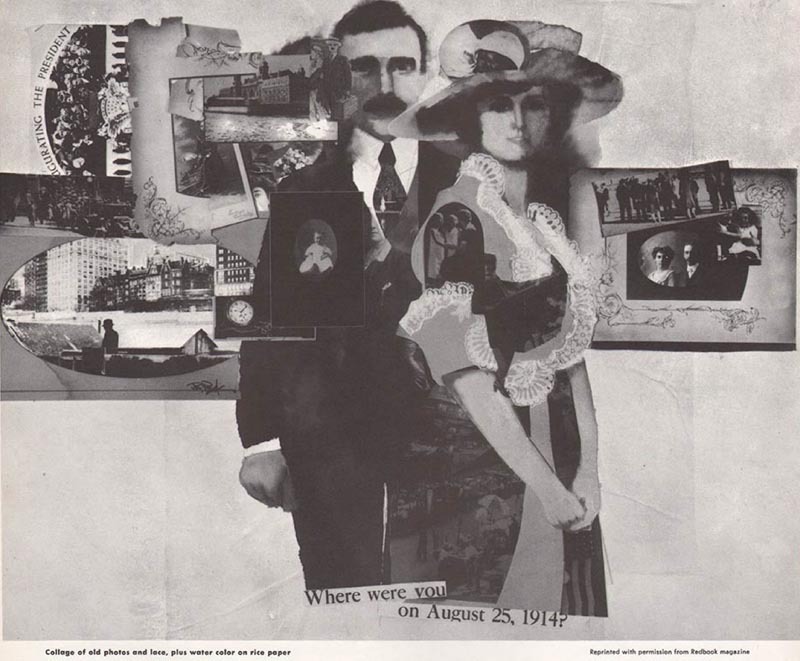 Peak, Fuchs, Briggs, Fawcett and many others found commercial art challenging, because it wasn't just a paint-what-you-wanna-paint approach, as it is in fine arts. I think it was very satisfying for those illustrators, knowing they had professionally solved their client's problems, and could take pride in the end product. Yes, exactly, Tom! And by way of example, in Peak's AA interview he talks about how "often an assignment will require many drafts going through a whole series of transformations, and the final one will often closely resemble the initial idea." There are some great examples in Peak's FAC chapter of this transformative process - the best being his poster art for the film, "My Fair Lady." Peak clearly enjoyed working through that problem-solving process - and clients often insisted on many revisions, not content to settle on the first thing that came out of his pencil. That being said, star illustrators like Peak did and do get called in on projects just because they are a name brand, as Remo suggests. Charlie gave us that great example from his Del Monte account - and how the west coast guys were much chagrined that Peak had been paid a higher rate - just so the AD could have a Bob Peak illo under his belt. Thanks Leif and all! Its so nice to see a post like this on my dad. Also some images that I HAVEN'T SEEN before...bravo. If anyone has scans, please send them to me so I can put them up on the website. Also, being his son and apprentice, any questions about his thought process and technique just send my way. Bob Peak. Simply an amazing talent. He was a gifted problem solver and obviously enjoyed the challenge of using his talent to solve client issues. This obviously pleased his clients and Bob. He was the quintessential commercial artist. That is what a commercial artist does. Too many young artists seem to have ego issues desiring to please themselves first vs understanding the purpose of commercial art.